The modern languages department at Christ’s is vibrant and flourishing. We understand the importance of communication in an increasingly globalised world. The course will challenge intellect, general study skills and ability to learn. We have very high expectations of all our students and challenge each of them to achieve their personal best. equip students with transferable skills such as autonomy, resourcefulness, creativity, critical thinking and linguistic, cultural and cognitive flexibility that will enable them to proceed to further study or employment. The Spanish department is led by Ms Campa who shares teaching with Mr Higinbotham. The department follows the Pearson Edexcel examination board. Puente: Introduction to Spain and the Hispanic World. Theme 1: (Set in the context of Spain only). The society of modern Spain: changes in family structure, the world of work and the impact of tourism. Theme 2: (Set in the context of Spanish-speaking countries and communities). Music, festivals and traditions in Spain and Latin America. La cultura política y artística en el mundo de habla española. Theme 3: (Set in the context of Spain only). Impacts of immigration on Spanish society, public reaction and social impact. La inmigración y la sociedad multicultural española. Theme 4: (Set in the context of Spain only). Civil war and the rise of Francoism, dictatorship and the transition to democracy. In addition to the four themes, students will study a book and a film. Our book is ‘Bodas de Sangre’ (Blood Wedding) by Lorca and the film ‘Mar Adentro’ (The Sea Inside) by Alejandro Almenábar. Students will develop a detailed understanding and appreciation of both works and, in their assessment, are expected to provide a critical and analytical response by selecting relevant material from the works, presenting and justifying points of view, developing arguments, drawing conclusions based on understanding and evaluating issues, themes and cultural and social contexts. 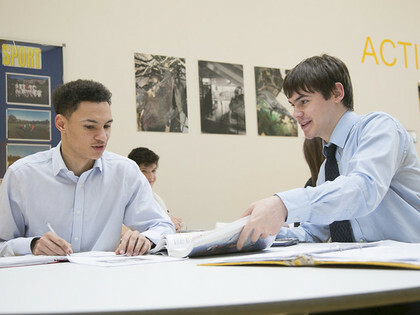 Part of the oral examination provides the students with the opportunity to show their individuality by selecting, researching, presenting and discussing a topic of their choice. The research may be based on one of the themes or on the student’s own subject of interest related to society and culture of the Spanish language. Paper 1: Listening, reading and translation. Written examination: 2 hours, 40% of the qualification, 80 marks. This paper draws on vocabulary and structures across all four themes. Students are not permitted access to a dictionary during the examination. Section A: Listening (30 marks) A listening assessment based on a recording, featuring male and female Spanish speakers. Students will respond to comprehension questions based on a variety of contexts and sources. Section B: Reading (30 marks) A reading assessment based on a variety of text types and genres where students will have to respond to comprehension questions. Section C: Translation into English (20 marks) An unseen passage to be translated from Spanish to English. This paper draws on the study of two discrete Spanish works: a literary text and a film. This paper includes a translation exercise and two essays on either two literary texts, or one literary text and one film (students must not answer questions on two films). Students are not permitted access to a dictionary or any documentation relating to the works during the examination. Section A: Translation (20 marks) Students translate an unseen passage from English into Spanish. Section B: Written response to works (literary texts) (50 marks) Students must write an extended response the chosen literary texts (Bodas de Sangre). Students select one question from a choice of two. Section C: Written response to works (films) (50 marks. Students select one question from a choice of two for their chosen film (Mar adentro). Internally conducted and externally assessed Total assessment time: between 21 and 23 minutes, which includes a single period of 5 minutes’ formal preparation time, 30% of the qualification, 72 marks. Students complete two tasks. Task 1 is worth 30 marks and Task 2 is worth 42 marks. Task 1 (discussion on a Theme) Students discuss one Theme from the specification based on a stimulus containing two different statements. Task 2, Part 1 (independent research presentation) Students present a summary of at least two of the written sources they have used for their research and give a personal response to what they have read. Task 2, Part 2 (discussion on independent research) Students answer questions on their presentation and then have a wider discussion on their research. This course will encourage students to participate in a residential trip to Spain to experience and acquire more knowledge of the Spanish society, language and culture, accompanied with an intensive course in a language school. We also encourage our students to take part in different languages challenges and projects organised by different universities. We invite our students to help our community at Christ's by offering their time and talent, helping other students in the lower school with their language skills. Our students also stretch their skills by providing taster Spanish lessons to our local primary school where Spanish has not been taught. Studying a language opens new horizons and provides students access to different countries and cultures. In recent years there has been a huge increase in jobs with multinational companies where the knowledge of a second language is essential. Many jobs and careers now have a foreign language dimension providing prospects for working abroad. It is possible to study modern languages either as a single Honours degree or alongside another subject as a joint Honours degree. Common joint Honours choices often remain within the humanities including subjects such as politics, history and literature, but modern languages can also be combined with subjects such as chemistry or mathematics for those wishing to keep their options as broad as possible. A language degree can qualify graduates to work in education, translation, interpretation, tourism, trade, PR, communications and management. Many government jobs require language skills, particularly in the sectors of immigration and diplomacy. All sorts of career destinations - doctors, psychologists and physiotherapists need language skills to communicate effectively with patients whether they work in the UK or overseas; businessmen, bankers and entrepreneurs all need language skills to make deals and sell products on the global market. Politicians, historians, geographers and holiday representatives all need language skills. Languages are an invaluable skill to have. Studies show that having another language could increase your salary from 8% to 20% and give you a head start on other potential employees, as this is vital to companies that do international business. Furthermore, a language is also a prerequisite for many university courses. Pearson Edexcel A level Spanish (includes AS), Mike Thacker, Simon Barefoot, David Mee, Mónica Morcillo Laiz. Edexcel Spanish for A Level Student's Book, Mike Thacker, Monica Morcillo Laiz, Monica Morcillo. Compulsory Literary text book: âBodas de sangre, by Federico Garcia Lorca. Compulsory Film: Mar adentro, 2004 by Alejandro Amenábar. Grammar workbook: Ánimo grammar workbook: Spanish AS and A2. The following websites are suggestions for possible research, or for authentic reading or listening materials.